Fund PILT or Give Back Our Public Lands! An ordinance that would regulate the cultivation of marijuana for personal use and by medical marijuana caregivers in unincorporated areas of Fremont County will come up for consideration by the Fremont County Board of Commissioners at their regular meeting next Tuesday, March 8th. The ordinance will address restrictions on both indoor and outdoor cultivation of marijuana. The ordinance places specific limits on the number of marijuana plants that can be cultivated. It also restricts access by requiring fencing on all outdoor marijuana grows and addresses lighting, odors, and limits on visual observation of marijuana plants. The ordinance will be considered on first reading and the Board of Commissioners will take public comment on the proposed regulations. Citizens can also submit public comment in writing. The proposed ordinance can be accessed and reviewed by the public by going to the Fremont County website at www.fremontco.com and clicking on the link under the public notice on the home web page. The Board of Commissioners meets at 9:30 a.m. Tuesday, March 8th, in Room LL-3 of the Fremont County Administration Building. Construction crews were putting the finishing touches this week on the newly reconstructed Arkansas River levee that carries the Riverwalk Trail west of the Raynolds Avenue Bridge. 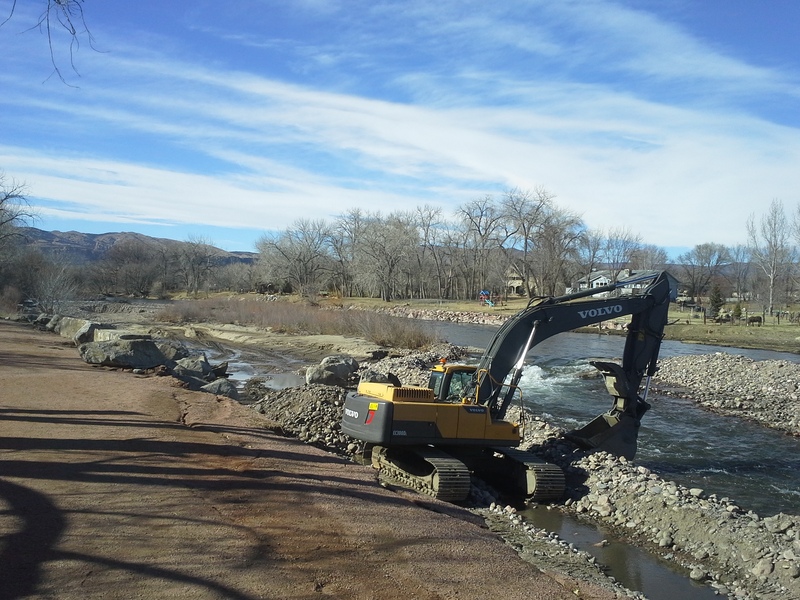 With three months to go before runoff from winter snowpack again pours down the Arkansas River, Fremont County has successfully completed the reconstruction of a levee that was undermined last June by near record water levels. The Arkansas Riverwalk reopens Friday morning after the levee 300 yards west of the Raynolds Avenue Bridge was reconstructed over the past month. Fremont County Manager George Sugars said Whinnery Construction of Lake City completed work on the levee earlier this week. 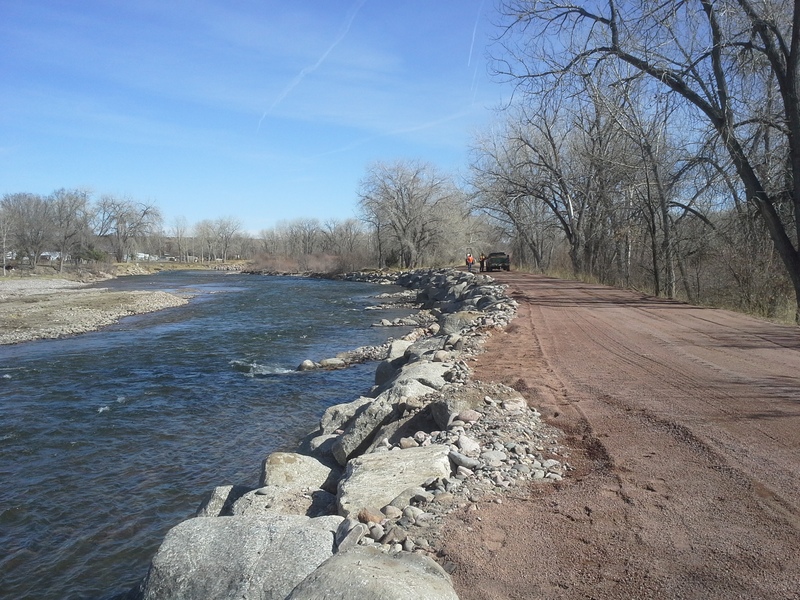 After first having to divert the stream flow to allow heavy equipment to go to work in the river bed, crews finished installing ten-ton boulders that should protect the levee from any future flooding damage. The original concrete wall that was constructed in the early 1990’s was undermined and collapsed during the high spring runoff last May and June. Whinnery Construction was the successful low bidder on the project at a cost of $147,235. The Board of Commissioners will consider a $40,000 change order at next Tuesday’s meeting to cover the additional cost of finding and installing boulders that met the engineer’s specifications. Fremont County intends to recover seventy-five percent of the cost of the project from the Federal Emergency Management Agency (FEMA). The Cañon City Recreation and Park District also contributed $14,000 towards the initial cost of the project last fall. An example of unfinished construction in western Fremont County that leaves a blight on some mountain neighborhoods. Fremont County secured a court order five years ago to clean up this property. Even then the owner would not comply. When the property went to tax sale the county worked with the new owner to clean up the entire property. Dressed in red shirts in a display of unity, residents of the Copper Gulch area southwest of Cañon City on Tuesday again voiced their concerns that they are upset with trash filled properties and the proliferation of marijuana grow sites throughout their area. John Garrou charged that the county has done nothing in hopes that if the county ignores them long enough they will go away. Garrou is particularly upset about properties that may have secured building permits, started construction, but walked away and abandoned the property. Garrou said those properties are the responsibility of the county zoning and building departments. Rich Bandlow said he and his neighbors are upset everyday that they drive past the trash filled properties that aren’t addressed and wonder how they came to be living up there. Bandlow said that when the “dopers’ moved in two years ago the problems got worse with the marijuana grow sites. Bandlow said the residents are simply asking for the county to work with them to resolve the problems. Commission Chairman Ed Norden said the problems are not unique to the Copper Gulch area. He said the county’s code enforcement officers deal with similar problems around Penrose, Florence, and Cañon City adding that neighboring counties are dealing with the same issues. Norden said he has to look at the problem from a budgetary standpoint. He said given the budget cuts the county made during the recession he would have a problem hiring more code enforcement officers and another attorney to pursue all these matters in court when roads across the county continue to be substandard. Norden said there has to be a median somewhere between enforcement, spending, and getting people to take pride in their own property. District 2 Commissioner Debbie Bell said she agrees that the properties need to be cleaned up. Bell said however that she believes in personal property rights and the county must follow due process of law in forcing property owners to comply and clean up their properties. Bell and Norden said the county will continue to meet with staff to monitor progress on cleaning up problem sites across the county. The commissioners on Tuesday also voted to approve a zone change for MountainDale Campground along Barrett Road located just south of the Fremont-El Paso County line. Brian Emry was seeking the zone change from Ag Forestry to Travel Trailer Park and Campground zone in order to pursue expansion of the MountainDale Campground. A number of neighbors along Barrett Road protested the zone change citing concerns about the threat of wildfire from campfires, drainage issues, increased traffic, depressed property values, and trespassing on private property by campers. Several said the trespass problems already exist and will only get worse. Emry said he has worked to resolve specific cases of trespass that came to his attention and has an employee who is vigilant about checking on campfires late at night to make sure campfires have been extinguished. Emry also said he has an approved fire plan and 30,000 gallons of water storage, in addition to water on trucks and trailers. In approving the zone change the Board of Commissioners noted that the MountainDale Campground has existed along Barrett Road since 1943 long before many of the residents built homes on neighboring property. Chairman Norden said for that reason he believes the neighbors' concerns about lower property values are unfounded. Approved a waiver for an annexation impact report for property owned by Sam and Dawn Smith who want to annex their property into the City of Cañon City. Whinnery Construction of Lake City has rerouted the flow of the Arkansas River west of the Raynolds Avenue Bridge as levee reconstruction is underway. A block wall along the flood control dike was undermined during flooding and runoff last May and June. The $147,000 project should be completed within several weeks. 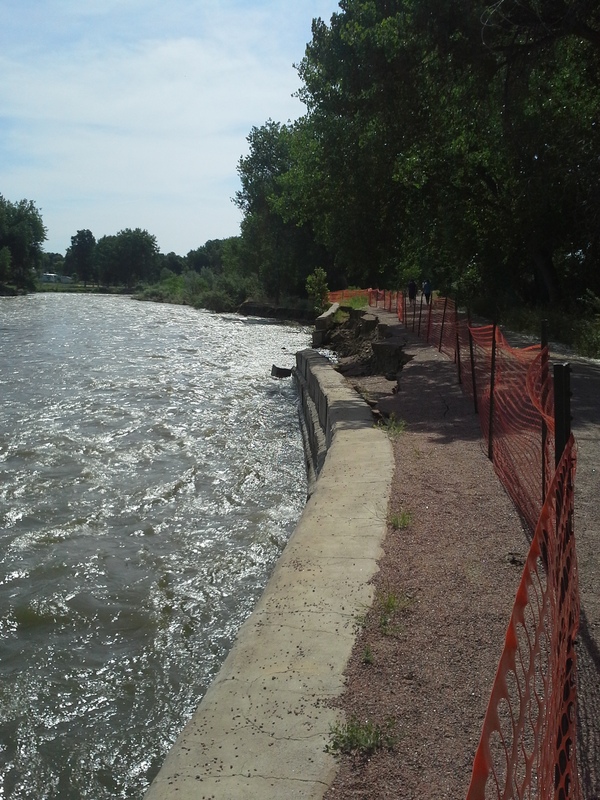 The Federal Emergency Management Agency will reimburse Fremont County for 75% of the cost. The Fremont County Board of Commissioners gave final approval to an amended plan to allow Accessory Dwelling Units (ADU’s) in Fremont County at Tuesday’s regular meeting. The ADU proposal was tabled from the November 24th meeting following opposition voiced by the Penrose Water District and the Beaver Park Water District. Both argued that allowing ADU’s would increase density and create more demand for water which Penrose is not in the position to provide. To address that problem the commissioners opted to amend the ADU proposal by doing away with a countywide overlay zone. Instead the county will rely on a permitting process whereby a water provider such as the Penrose Water District could deny water service for Accessory Dwelling Units. Penrose Water has already indicated they would require a second water tap for such ADU’s instead of connecting to the existing water line. Commission Chairman Ed Norden said the ADU zoning amendment still requires a minimum lot size of one acre for ADU’s, that the property owner live in one of the residences, that the ADU have a separate entrance, that utilities be shared with the main residence, and that the primary residence be built on the property before the ADU. District 2 Commissioner Debbie Bell said despite the continued opposition from the Penrose Water District the ADU proposal had a lot of support when it was first proposed last fall as a way to deal with the existing housing shortage in Fremont County. District 1 Commissioner Tim Payne said there was also support from people who wanted to add on a so-called ‘mother-in-law’ cottage to house aging parents or their adult children who might not be able to afford other housing options. The ADU amendment goes into force with adoption by the commissioners. 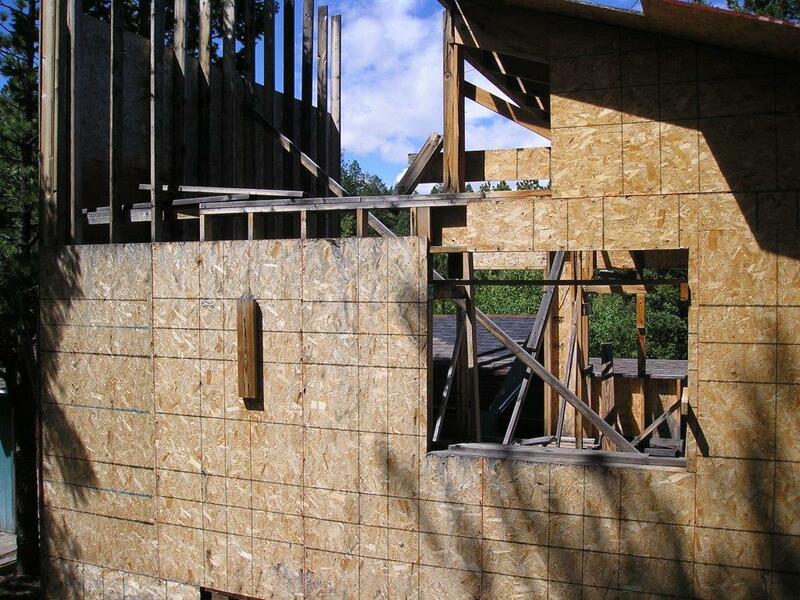 Persons wanting to add an ADU on their property must initiate an application process through the Fremont County Office of Planning and Zoning. The commissioners on Tuesday also voted to approve the purchase of 20 Chevy Tahoes as part of the sweeping replacement of vehicles at the Fremont County Sheriff’s Department. Replacement of the Sheriff’s high mileage fleet of cars was among the priorities listed when voters approved a one cent sales tax increase for the Sheriff two years ago. County Finance Director Sunny Bryant said the fleet purchase is being accomplished through a lease-purchase arrangement in the amount of $1.2 million through U.S. Bancorp. Bryant said after this initial 20 vehicle purchase the Sheriff proposes to rotate out about four vehicles each year in the future. Scheduled a public hearing for Tuesday, February 23rd at 10:00 a.m. on a zone change request from Ag Forestry Zone to Travel Trailer Park and Campground zone for the Mountaindale Campground along Barrett Road near the Fremont-El Paso County line. Mountaindale wants to expand to allow 26 new RV sites and convert existing cabins to other uses. The campground has operated for decades along Barrett Road as a non-conforming use within the Ag-Forestry zone. The Fremont County Board of Commissioners are set to make a decision at their Tuesday meeting on whether to permit Accessory Dwelling Units (ADU’s) on properties in the county. The Commissioners tabled the issue at their November 24th meeting last fall after hearing opposition from the Penrose area. The ADU proposal came forward as a way to provide alternative and affordable housing if property owners have large enough lots to construct living space adjacent to their primary residence. The Penrose Water District and Beaver Park Water opposed the ADU amendment saying their districts do not have enough water to support an increase in density. The amendment that comes back before the Commissioners at Tuesday morning’s meeting will hopefully resolve that issue. The amended language requires the property owner to show “Written proof from the appropriate entity or service provider that water and sewer/septic services are adequate for all uses on the parcel.” Because some Penrose residents may have their own water wells it would permit them to pursue an ADU while Penrose Water District customers would have to get written approval from the district to proceed. The rest of the amendment would still permit two residences on a single parcel that is a minimum of one acre in size. The ADU could be no larger than 1,000 square feet, have no more than two bedrooms, and only one bathroom. The ADU’s would share utilities with the primary residence. The property owner would also be required to reside in one of the residences. Over the years county officials have heard requests from property owners who wanted to construct living space next to their primary residence so that might care for aging parents or provide space for other family members. The ADU amendment is on the agenda for reconsideration at the Board of Commissioners meeting at 9:30 a.m. Tuesday, February 9th, at the Fremont County Administration Building. The Fremont County Board of Commissioners will return to Howard this Thursday evening to host another town hall meeting discussing a wide range of topics. The Commissioners summoned a town hall meeting last November in Howard to discuss the future of the Western Fremont County Park. The park is in the Acres of Ireland subdivision. District 3 County Commissioner Ed Norden said a renewed commitment of volunteer work is needed to keep the park in operation. An interim volunteer committee stepped forward in November with a pledge to recruit a permanent committee to work with the county. Norden said he specifically wants to discuss steps that need to be taken this spring to make the park more inviting for families around a children’s playground and picnic shelter. The park has been plagued with overgrowth of puncture vine which has limited the park’s usefulness. Norden said Fremont County Weed Coordinator Jana Rapetti will attend to discuss chemical control options for the weeds this summer. He also wants to hear how the volunteers plan to keep the park mowed through the summer months. At the November meeting Howard residents asked the commissioners to return this winter for another town hall discussion and expand the topics to include county roads and law enforcement. To that end, Norden said Fremont County Sheriff Jim Beicker will be in attendance along with supervisors from the Fremont County Department of Transportation. Norden said Commissioner Debbie Bell and Assistant County Manager Sunny Bryant will also take part in the town hall meeting. The meeting begins at 6 p.m. this Thursday, February 4th at the Howard Volunteer Fire Department. The Fremont County Board of Commissioners gave their blessing at their January 26th regular meeting for the Tallahassee Volunteer Fire Department to move forward with their proposal to ask voters to create a new fire district in northwest Fremont County. The Commissioners’ approval of the service plan came after a nearly 90 minute public hearing in which organizers detailed their proposal while several opponents questioned how emergency services will be delivered. Colorado law requires that when a new special district is proposed a service plan has to be presented to the Board of County Commissioners for their approval. Tallahassee Volunteer Fire Chief Gordon Grosslight and Attorney Mike Meyrick detailed the proposal at the hearing. The plan proposes that the new district would cover a service area across much of northwest Fremont County on either side of Colorado Highway 9 including the Tallahassee area and the Deer Park area towards the Teller County line. Grosslight said contrary to rumors the new district intends to respond to fight structure fires in addition to wild fires. He also said volunteers will respond to render medical first aid to patients until an ambulance can arrive on scene. He said establishing ambulance service would be a long term goal for at least five years into the future. Grosslight said initially the new fire district would not assess a property tax mill levy but continue to rely on contributions and fees for service. Several residents expressed doubt about how creation of a fire district would improve service to such a vast rural area and criticized past responses. Roberta Herring was one of several residents who said they were threatened by a volunteer that if they didn’t pay their dues and they had a fire their house would simply burn down. Volunteer firefighter Jerry Worthley said he’s seen nothing but dedication from the firefighters and never has there been an implication that they wouldn’t respond to everyone’s home. Grosslight said among the incentives to form a legal fire district is to possibly lower insurance costs for residents in the area as well as qualify the department to receive various grants to improve equipment and services. While several residents had requested that their property be excluded from the new fire district, Meyrick said that would pose a problem for firefighters because a fire on those properties that would not prompt a fire department response could quickly spread to adjoining properties and cause bigger problems. The Board of Commissioners approved the Tallahassee Fire District service plan as proposed and did not exclude any of the properties. The next step for organizers is to take their plan to the District Court. If the judge approves the service plan an election date would be set in which property owners within the proposed boundaries would have the final say on whether to create the new Tallahassee Fire District. Another lengthy public hearing at the January 26th meeting saw the Board of Commissioners approve a Special Review Use Permit for Jennice Fagin to sell a commercial hay product to customers from her ranch property at 3rd and ‘I’ Streets in Penrose. Neighbors had filed complaints over a year ago about the impacts to the neighborhood from semi-trucks delivering the pallets of hay to Fagin’s property while parked on the county road with a forklift unloading the pallets on the roadway. Fagin contended that her sale of the hay should be treated the same as anyone else in the Penrose area who sells agricultural products. The Commissioners approved the permit with the requirement that Fagin improve the driveway on her farmyard to allow the semi-trucks to pull onto her property to unload the pallets. The Board said those improvements must be made before the next load of hay is delivered. The Commissioners also urged Fagin and her neighbors to get along and did not want to hear any reports of retaliation. Approved a $58,227 expenditure to replace fire sprinkler heads in the front section of the Fremont County Jail which date back to the jail’s opening in 1988. Vandal proof sprinkler heads will also be installed in the two pods of the newest section of the jail. The Fremont County Planning Commission will hear a request for a zone change near the Fremont-El Paso County line at their February 2nd meeting that would allow an existing campground to expand its’ facilities. Brian Emry wants to add 26 new RV sites and convert existing cabins to other uses such as laundry facilities, bathhouses, and recreation rooms for the Mountaindale Campground along Barrett Road. Emry has applied for a zone change from Agricultural Forestry Zone to a Travel Trailer Park & Campground Zone. The existing campground is considered a non-conforming use in the Agricultural Zone because it has been in existence since 1943 which predated zoning regulations. Mountaindale Campground currently has 88 existing RV sites and 7 cabins. To expand the campground facilities under current regulations Emry must pursue a zone change. Emry also is proposing to add a swimming pool and maintenance building to the expanded campground facilities. The campground site is on 45 acres on the north side of Barrett Road just south of the El Paso County line. The zone change request for MountainDale Campground is the only agenda item for the Fremont County Planning Commission which will meet at 3:00 p.m. on Tuesday, February 2nd, in the Board of Commissioners meeting room on the lower level of the Fremont County Administration Building in Cañon City. The money distributed comes from the two percent lodging tax collected from overnight stays at Fremont County motels, hotels, and campgrounds. Fremont County has already collected a record $173,000 in lodging tax revenues through October of 2015 with revenues still to be tallied for the final two months. The record lodging tax revenue is a reflection of the continued tourism recovery following the 2013 Royal Gorge wildfire. The previous peak year for lodging tax revenues was in 2007 with $162,000. Tourism Council by-laws require that a minimum of five percent of lodging tax revenues be distributed annually to community groups to help them promote their events.